Set up a dynamic pop-up – a type of pop-up, that can display recently abandoned products from a particular client’s shopping cart. The customer could see a dynamic pop-up on their subsequent visit and reconsider buying the abandoned product. If the information you have in your XML is detailed, so will the dynamic pop-ups. Using AI Machine Learning – a module that relies on an intelligent recommendation algorithm, an advanced technology that analyzes and studies customer behavior to predict what they are likely to buy in the future. The module takes into account a complex set of data, such as transaction history, product category correlations, buyer paths and more to deliver personalized offers in the right moment and medium. Implementing the Automatic Sales Chat – a bot synchronized with a Facebook page, that can act in place of customer service, especially in routine cases and issues, or during the first contact with a new client. Automatic Sales Chat can display products, redirect to product pages, load product descriptions and answer questions. You can create any number of scenarios of varying complexity to cover all situations. TIP: The descriptions of the scenarios above are only examples of what can be done and information that can be used to create dynamic e-mails, dynamic recommendation tables or dynamic pop-ups. We can create all sorts of scenarios and the only limitation is the information that is found in the XML – the more information you have in them, the more abilities to help you create unique possibilities. to create a dynamic project with an abandoned cart – send information about an external event – cart. to create a dynamic project with a purchased product – send information about an external event – purchase. 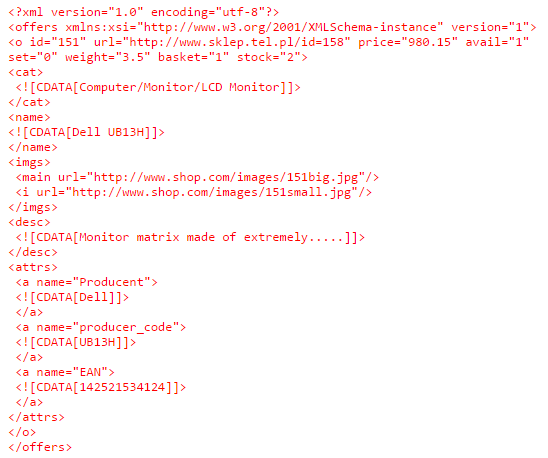 to match products that are bestsellers, for example, information as to which products are bestsellers, has to be in the XML. to pull information into dynamic content about promotional prices – this information also has to be present in an XML file. if you have seasonal products, label them as such in the XML, and thanks to that you can use that information and XML structure to show current products to your client base. Additionally it has to be remembered that if some information about a product is not sent in the external event, but you want to use them for personalization within the dynamic content, they have to be in the XML. Products are identified thanks to the product ID. optional* – It is required for collecting transactional data. required1 – name filed should not be empty and cannot contain HTML tags and new line characters (enters). required* – in most of the cases it is required (especially when we want to use dynamic email, recommendation frame, dynamic pop-up features). every XML has to be available at all times at a specific URL address. Below you will find an example of an XML file. Please remember, that the XML file also has to be updated on a regular basis. The more information is available in an XML, the more unique and more advanced your dynamic projects will be! TIP: Remember, if you are not sure if you can create a scenario that uploads the right data into dynamic elements from your XML, please contact your Project Manager or at: support@salesmanago.com. Our team is always eager to answer your questions and will help you find the right solution for your industry!